The Vocal Technique & Vocal Development classes offer a maximum of 14 places (Vocal Technique) and 12 (Vocal Development) places once a week to those who sing in the various Addison Singers choirs, as well as those from outside. Please see the Enrolment tab for details of the revised enrolment procedure for Vocal Technique and of the September Draw. The Vocal Development class is a short class with technique + some group singing. It's a space where members can develop their voice in a supportive group environment. The Vocal Technique class aims to train voices by improving their technique, quality, breath support and range with each participant keen to hone their skills so it makes for a complete spectrum of singing competence. This class is not suitable for beginners, who should start with the Learning to Read Music class or the Vocal Development class. NB: To be able to enrol for Vocal Technique, you must have sung already with Alice Hyde. Otherwise, you are required to enrol for a minimum of one term in the Vocal Development class. This short Vocal Development class is suitable for people returning to singing, those who sing in a choir or aspire to join a choir and want some vocal practice first, as well as anyone wanting to learn good breathing techniques and warm up routines. This will also be useful e.g. for public speaking, teaching and for confidence building. The choice of group repertoire will be made within the group under the tutor's guidance. Maximum of 12 singers in the class. The Vocal Technique class includes warm-ups, breathing exercises, scales, group and individual singing. The repertoire covers classical, jazz and popular music, by mutual arrangement with the Tutor. The class also offers sight-reading and group singing, singing songs in parts, along with the specific vocal technique exercises. Whilst the very thought of it may seem daunting to some, members are encouraged to sing solo as a means of building confidence. This is done sympathetically with constructive criticism, from which all the class members can benefit. Although most members do sing solos, it is not a requirement of joining and groups of 3 or more can sing together in order to work on vocal and performance technique. 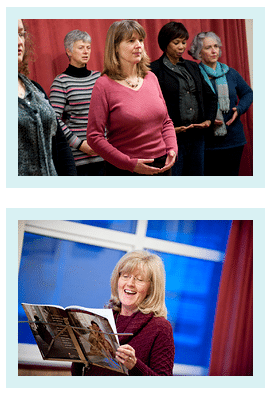 Members also have the opportunity to get help with any piece of music they may be having difficulty in mastering from the Classical or Jazz Choirs music programme and the class also attracts some keen amateurs who want to polish up a specific piece of music to sing at a wedding, or other special occasion. Maximum of 14 singers in the class. ENROLMENT PROCEDURE - Please see the ENROLMENT tab for details of the revised enrolment procedure for Vocal Technique and of the September Draw. Vocal Technique enrolment is open ended, with a draw taking place in early September out of all paid for enrolments. In order to give as many singers as possible a chance for a place in the Vocal Technique class, there is no maximum number of singers allowed to enrol online, but you must have sung in Vocal Technique or with Alice Hyde before. Singers who haven't are required to enrol for a minimum of one term in the Vocal Development class. Approximately two weeks before the start of the Autumn term, a draw will take place to select 14 names. Members not selected will be able to 1) transfer to Vocal Development, 2) if the number of applicants is sufficient, join a newly created Vocal Technique 2 class, or 3) get a refund. They go automatically on the waiting list. In order to be included in the September draw, please make sure you enrol online by midnight the day preceding the draw. Members on the waiting list will be given the opportunity to join Vocal Technique during the following terms of that academic year as soon as a place becomes available (i.e. when VT members who got a place in the September draw don't reenrol for either of the 2 following terms) and new members can join the waiting list at any time as long as they have sung with Alice Hyde before. The waiting list is cleared prior to each September start. Vocal Development enrolment is still on a first come, first served basis, for a maximum of 12 places. NEW FOR SPRING 2019: The number of places in the class is limited to 12. There will be a reserve list for Vocal Development in case members who have enrolled early advise the Membership Coordinator before term starts that they want to swap classes or are unable to attend. If you have enrolled for the class and are unable to attend, please contact the Membership Coordinator so your place can be offered to the next person on the reserve list. Before the start of term, the Membership Coordinator will contact those who have been unable to secure a place and either offer a refund or a transfer to another class and they will be placed automatically on the reserve list. New members: Please enrol online before term starts by first registering here on the Addison Singers website, then purchase a Class membership, click on Checkout and choose a payment method. Existing members: Please login with your email address and/or reset your password, purchase your membership and select your payment method. Please note that your membership is not valid until payment is received through the Addison Singers bank account. As long as there are spaces available in the class to do so, any potential new member is welcome to try a 'taster session' for the Vocal Development (not for Vocal Technique) during the first week of term to see if they would like to join the class. Please let the Membership Coordinator know if you would like to try one Vocal Development class. We will arrange for a 'buddy' to show you around and answer any questions you may have. At the end of the session we hope you will decide to join and you will be asked to complete the online enrolment and pay for the full term. If a member does not take up a place or complete a term for any reason (other than the above) there is no entitlement to a refund. You can however opt to transfer your fee to the following term. If you wish to transfer to another choir or class you need to consult our Membership Coordinator, and any difference in the fee or subscription must be paid or be refunded. If you require a receipt for your postal enrolment, you will need to enclose a stamped self-addressed envelope.